Since 1999 he set up his own website P-ART PARADISE where his universe is largely displayed. It also contains pages of fellow artists like amongst others Baudouin Oosterlynck, Moniek Darge, Alvin Curran, Laurie Spiegel who also contributed to the CD compilation ‘P-ART Project’. In 2004 P-ART published a DVD ‘White as Piano’ which shows the many facets of his personal work. Between 1978 and 1983 Paul Timmermans was also chief editor of ‘Muziekkrant’ an interesting independent three monthly magazine mainly about classical, traditional, contemporary music and jazz in all its forms. Around that time he also organised workshops with a.o. Karel Goeyvaerts of whom Timmermans also published an autobiography. For the concert P-ART will perform a few pieces on prepared spinet and some microtonal pieces on analogue synthesizer. Joris de Laet, born in Antwerp 1947, is an autodidact electro-acoustic music composer active since the early 70’s. He started with thorough research in possibilities and characteristics of sound amplification and built his own electronic instruments. In 1973 he founded the SEM (Studio for Electronic Music) with which he organised concerts, seminaries and lectures on monthly basis on different locations. A year later de Laet also formed the SEM ensemble in order to be able to have his works performed live in real time. 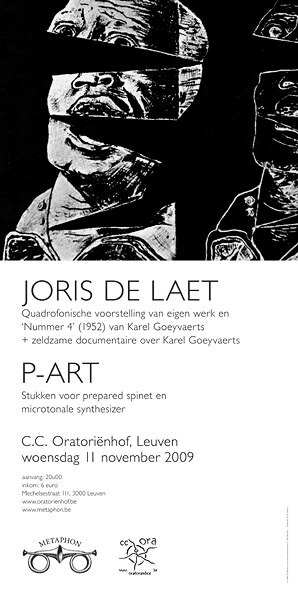 These works comprised various other disciplines as theatre, poetry and light experiments in which de Laet was supported by Karel Goeyvaerts and André Stordeur. De Laet met Goeyvaerts at training course he attended at IPEM between 1973 and 1975. Since then both worked together on several projects and performances. In 1997 de Laet won the SABAM prize for electro-acoustic music. He has privately released various CD’s of his own compositions. Apart from his activity as a composer de Laet is till this day teaching electro-acoustic composition at the Royal Flemish Conservatory in Antwerp. He knows the electronic synthesis as his inner pocket which one can also perceive in his complex adventurous compositions. Metaphon coproduction with C.C. Oratoriënhof.